Yes, you read that right, we got a cat!! Jed and I have waited a long time for this and finally there was an opportunity to adopt one! 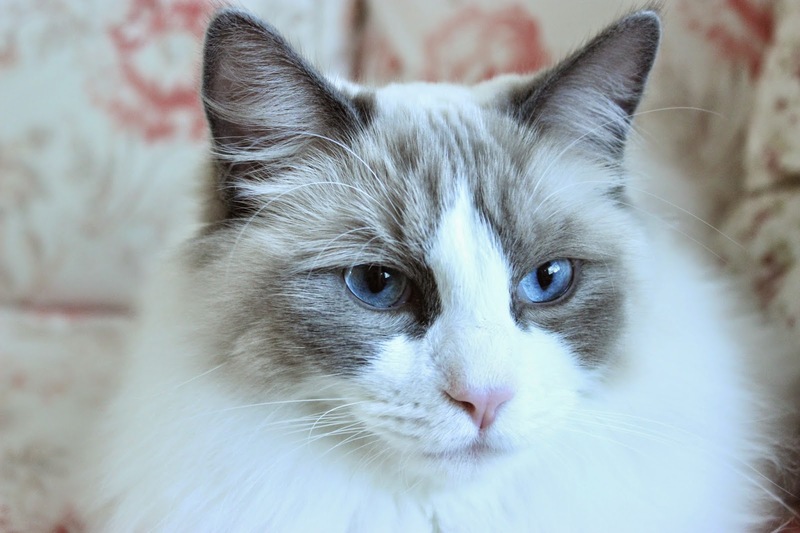 He is a bluepoint/bicolor Ragdoll and will be 12 months in the middle of September. He is a purebred* cat, and it was a situation where the woman who had him couldn't keep him any longer due to unforeseeable circumstances. 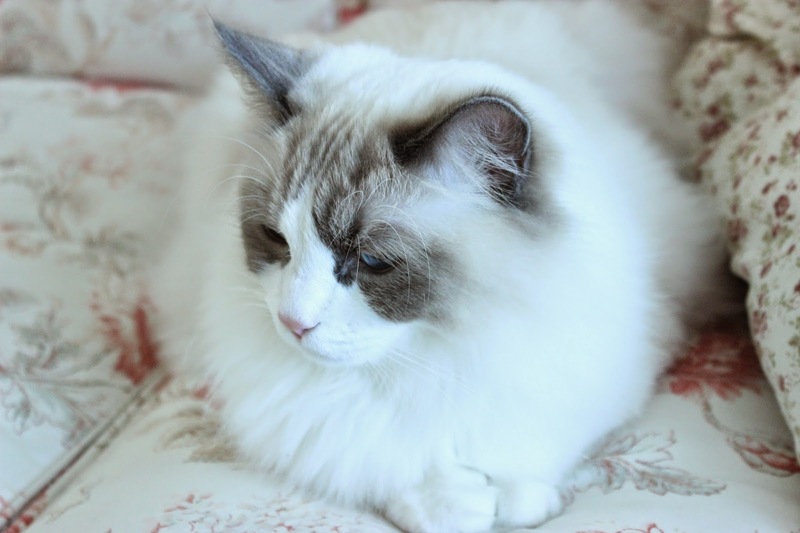 He was actually destined to become a breeding cat from the Ragdoll cattery where he was born, but the cattery was moving so they had to sell him. The woman we got him from had him neutered (thank goodness!). We are so in love with this little/big fella and we are thrilled that he is part of our little household! 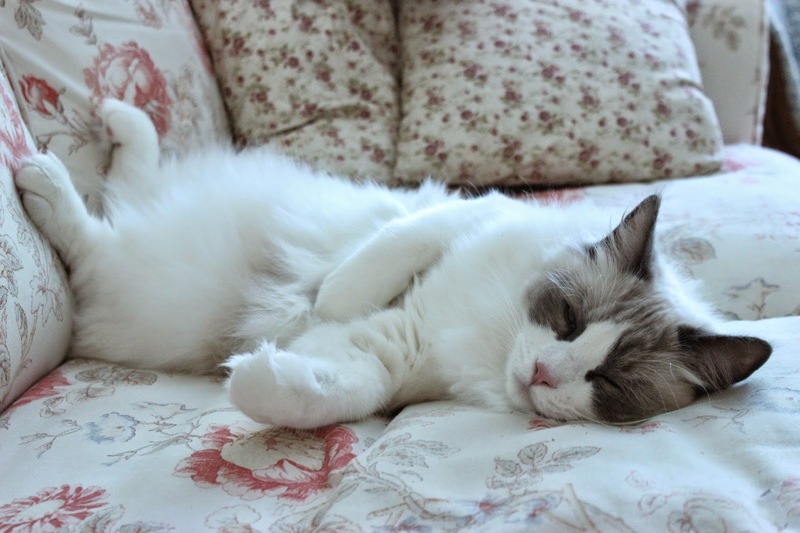 I have always wanted a Ragdoll cat because they are said to be great with children and can be trained quite easily. And although I grew up with cats, they were always barn cats and I haven't had a huge amount of experience keeping a cat inside. I really didn't want to deal with shredded furniture and wanted a cat that would be good with people and wouldn't mind being picked up and held. This little guy is everything I ever dreamed of and more! Although naughty at times, I think he just needs time to adjust to his new surroundings. He has gotten into the habit of meowing all night long! We first thought we would let him into our room, thinking he might find a spot on the bed and sleep. But we soon discovered he had absolutely no interest in sleeping! He was all over us, purring and "kneading" as cats do (so adorable too!) but then he would hop off the bed and meow meow meow meowwww!! He wanted to play! So we decided this was just not going to work! So I looked up some tutorials on how to get your cat to stop meowing all night and we are trying out a system that I think might actually work. Basically closing the door at night and letting him meow as much as he likes, but we will give no mind to him. No "shushing" no "it's OK Ernest!" nothing. And soon we hope he will understand that his meowing gets him nowhere! We are also trying to play hard with him an hour or so before bedtime and then feed him his dinner after play time. This is in the hopes that he will settle down instead of go crazy around 10:30pm every night! Do you have a cat who likes to meow and play when it's bedtime? Any good tips you might like to offer this new cat owner? He is just the cutest little fluff ball there ever was and it's definitely hard to say no to the little guy! But I know it's for his (and our) own good!! P.S. Any good cat toy suggestions? It's sometimes hard to keep him occupied and he needs his exercise! He seems to like balls and shiny objects. So far we have some little catnip mice that he loves to toss around and run after. He also loves string, but I know that can be dangerous so I used some extra fabric bias strips I had laying around. He also LOVES the laser pointer, but we are extra careful with that one as not to point it in his eyes! I also like to use the laser pointer in conjunction with a toy like the catnip mice so he doesn't get frustrated. Aw, what a sweetheart! Right before I read your last paragraph, I thought - catnip mice! My sister's cat loves them. He also likes large paper bags, boxes and laundry hampers, and I've noticed other cats like those as well. Your kitty is adorable!!! I've loved the rag doll breed since I was a girl. I understand how you feel about purchasing a pure bred cat. 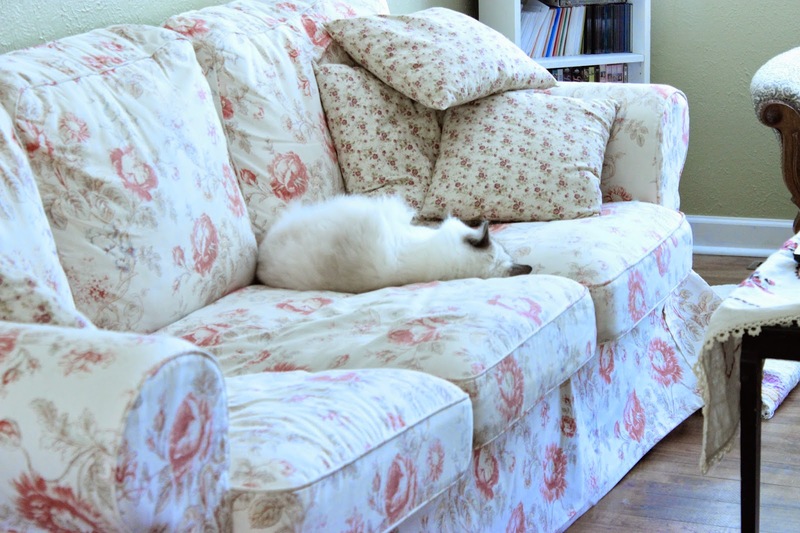 My senior "regular" cat who was from the shelter had to go live with my parents after my boyfriend developed seasonal allergies to her ;_;, so we bought a hypoallergenic Siberian (many, many photos of him here: http://instagram.com/jeannie.pham). Oh!! I forgot to mention...so with kitty exercise (and my cat is strictly indoors), it does take some participation on the owner part. I'm a pretty lazy cat owner :P so sometimes I forget to give my Moses his exercise. I highly recommend the Cat Dancer toy. It's cheap ($2), and I've yet to meet a cat who doesn't love it. It also lasts FOREVER. When the cardboard/paper bits wear out, I just tie ribbon to one end, and it provides endless entertainment (interactive once again). My cat and I also enjoy stalking and chasing each other back and forth down the house hall way. I'm not sure how to initiate that in a cat....but my old cat loved it, too. Putting some kibble or treats into an egg carton is great stimulation for cats, or putting some treats into a cloth napkin and folding it up to leave on the ground. Luckily, thankfully, I don't think the rag doll breed needs TONS of exercise...probably a good 25 minute session of intense kitty work out is sufficient. I find that my Siberian cat sleeps most of the day (18+ hours!!). I'm looking forward to more posts about Ernest. I agree that you should shut the door and let him meow at night -- when you don't give him a reaction, he will eventually learn to be quiet. We did this with all of our cats but it did take a while so ear plugs and patience is key! Anyway, sorry for the rambling post but I wish you good luck! Hi, Jeannie! Thank you SO MUCH for the helpful advice about the toys etc!! We are still trying to figure out a toy he won't tire of after 5 minutes! I think we just need to rotate toys and hide them so he doesn't get too used to them. I am totally going to get that Cat Dancer toy! It sounds fantastic! I think Ernest loves balls, but we don't have one yet. We just crumple a piece of paper into a ball and throw it and he goes crazy! Except he won't like it after awhile and we have to switch to a different toy. He seems to also love string and shoelaces. The catnip mice were awesome, but decided to put them away because I think the catnip was making him extra loud at night and he has since mellowed down. He doesn't meow except for a few seconds before bed and when the alarm goes off. lol. He knows that's food time! Ernest is so beautiful! I love his blue blue eyes and gentle demeanour. We have an adorable black rescue cat. He is very playful and affectionate. His favourite toys include the smallest soft toys you can pick up at Ikea for pennies. He loves then because they are so portable and the labels make a crinkling sound. He also loves hiding in cardboard boxes and messing around with our Welsh tapestry rug. I agree with Jessie about the water spray too. I only needed to use it for the first few months. Ever time I sprayed the water I would say 'off' with a long emphasis on the ffff sound. Now if our cat is trying for the butter etc I just need to say 'offff' and he retreats with an indignant meow. What a beautiful cat, and he looks so cuddly!! Unfortunately I've never had any pets, but seeing yours makes me want one!! I'm sure he will soon get used to your lovely home :-) xoxo! 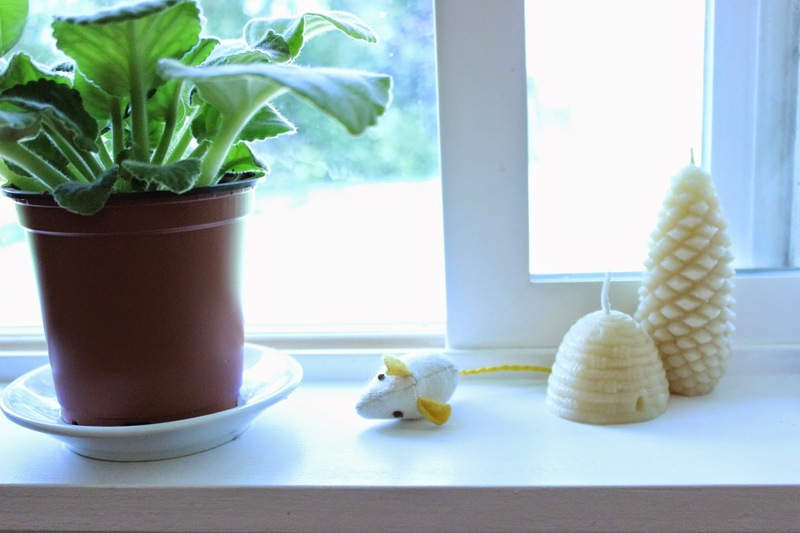 ps: I also love that little beehive candle in the picture! also it does help to play a lot with your cat before you go to sleep. eventually, he will accept it as his usual playing time, and will also play alone in this time. I had a cat that loved to play with matchbox cars! He would bat them around on the floor and chase them. They can be loud so you want to make sure to pick them up before going to bed! That is a brilliant idea! We are totally going to get a matchbox car. I think Ernest would just go crazy for it. In any case, they aren't expensive even if he doesn't end up liking it. 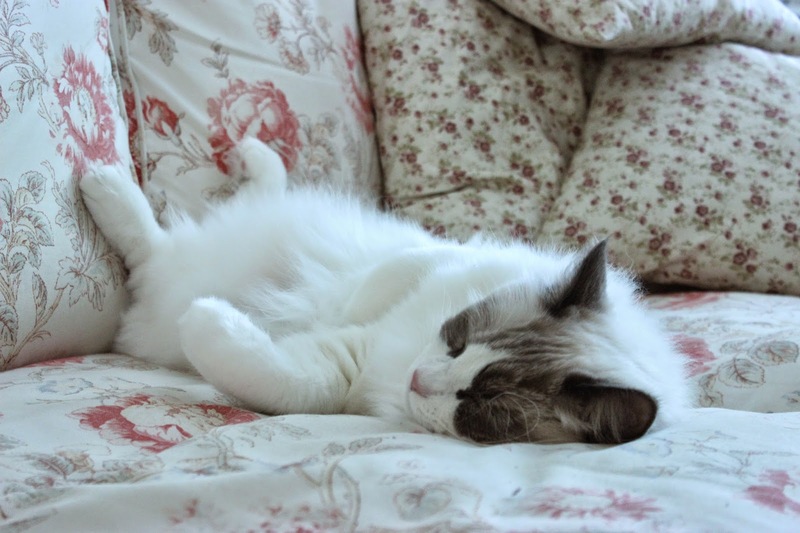 Having two ragdolls myself, I can easily say: best choice on the breed! I have had street cats all my life, but when my boyfriend and I decided to get cats we went for this breed. I've always wanted one and I can tell we'll have ragdolls all our lives. You have such a beauty! Mine are red point bicolour and blue mink mitted. Both of our ragdolls enjoy playing with us more than playing alone - unless it's plastic or a cardboard box (make holes in them and they end up playing together). One loves plastic bags a lot. We also have these little rattling balls which I throw around the appartement and they chase it like crazy. One of our two cats just loves, loves, loves catnip. So I regularly get new catnip cushions. He snuggles it, licks it, ... It gets really gross at some point, so we throw it away and get new ones. They get their fun mainly out of chasing each other. We found it really important to get two.